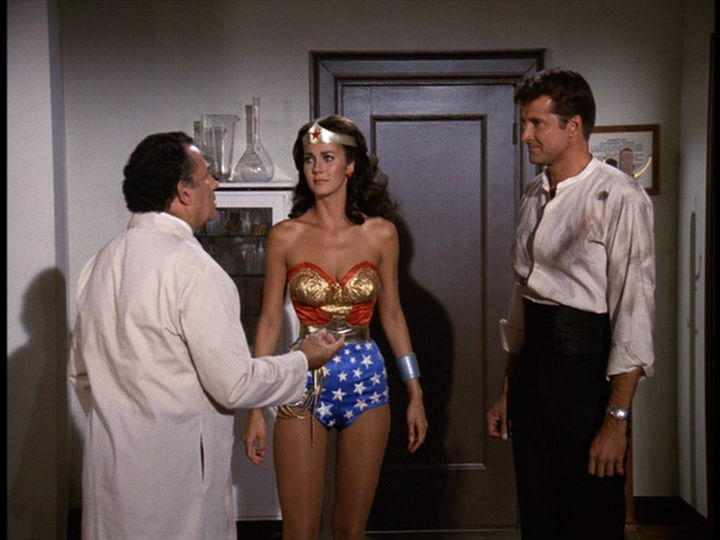 Kerensa: This week we watched Formula 407–which returned very much to a standard Wonder Woman episode. There were most certainly no aliens. I enjoyed this episode–I thought the pacing was good so it moved quickly and didn’t drag. I mean there were some parts that INFURIATED me. However, with this episode, I think I finally pinpointed one of my huge problems with the show as a whole. Noel: It was fine, I guess? I started drifting off a bit during the episode, though I was glad they explained how Keller would know if Moreno gave him the false formula because that was bugging me. I’m sure I can guess which parts infuriated you, and I’m even surer that most of them involved a Mr. Antonio Cruz. Let’s hear this epiphany first though! Keresna: What are you talking about?! Mr. Antonio Cruz is a total dreamboat and not a disgusting misogynist! My epiphany is stakes. There aren’t any. And I think that’s the flaw of the show. We know that Wonder Woman is always going to prevail, that no one is going to die and every episode is going to end with Diana’s silly smile. I mean obviously she’s the heroine of the show, so of course it’s going to go her way and that’s great. But there’s never any actual threat or bite or danger. She’s not going to question the cause (like we got in last week’s episode) or Steve and I just want more I guess. Of course this may be the time frame and the specific iteration of Wonder Woman we are given in the context of the show, but I want more complexity and something that feels like just maybe she can’t do it. Because she can, we know this, but I want to feel in awe of her and I want her to have more depth. Noel: Hm. I’m not sure I can entirely agree. I do want more complexity and depth, but I also don’t think that the show is interested in giving us those things. It’s 1970s family friendly action adventure light jiggle TV, and I don’t think it’ll ever get more ambitious than that (maybe when we change networks and time period settings in Season 2…? ), so I’m not willing to ding the show for being what it clearly has decided to be after 11 episodes. The stories and the depth aren’t any more complicated than most 1940s and 1950s comic book stories, and maybe that’s why I’m more…tolerant of it? 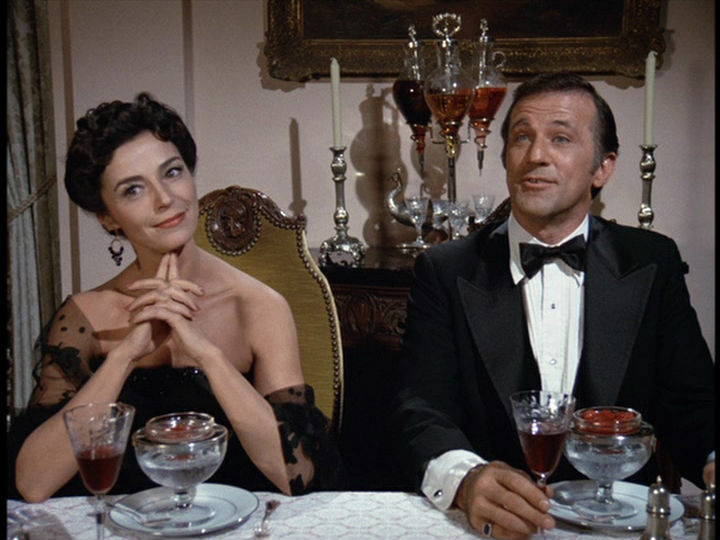 I don’t always find them compelling — “Formula 407” is probably the dullest episode for me since “Beauty on Parade” (“Wonder Woman vs. Gargantua” at least was kind of ridiculous) — but their tone and plot is in keeping with an overall approach. This issue of stakes…I grapple with it. I do think the show is bad at explaining or justifying stakes sometimes, though this isn’t surprising due to its ’40s-’50s comic book approach to storytelling. “Formula 407” is just pretty horrible in this regard. The formula’s vaguely connected to rubber production — a serious thing in the World War II — but is it really going to turn the tide of the war that incredibly? The episode is not convincing of this in the slightest, and so it’s pretty hard to care who gets the damn formula. I spent more time trying to figure out how old Lydia was, because she and Steve were skeeving me the hell out. At the same time, you’re defining stakes against an issue of predictability and formula (at least that’s how I read that, so please clarify if I’m wrong! ), and as a fan of procedurals, I don’t know that “figure out killer” isn’t any more or less compelling than “stop the Nazis from getting the formula,” at least on paper. Execution of that is another issue entirely, as this episode shows and any boring episode of Castle can demonstrate today. Like, I felt threat and danger in “Judgment from Outer Space” when both Andros and Diana were captured and powerless, and that the Council of Planets was pretty serious about blowing things up. Sure, I knew they’d be okay and that Earth would be spared, but I did get caught up in things. So, for instance, I think we can both agree that the plot of “Last of the Two Dollar Bills” was sort of sillier than usual, and that the plan to flood the economy with phony two dollar bills probably wasn’t the most interesting of plans, but we found things that were interesting that sort of covered up that. Do we notice a lack of compelling stakes when there’s other things to…”distract” us, I guess? Kerensa: This is how I thought you’d react! We’ve come so far! I do agree that the show is not interested in those things at all and I figured you would have a bit more insight to how things in the comics played out. Yeah, the formula is SO VAGUE. It’s really not convincing of caring about the formula at all. And agreed on the Lydia age tip–Steve’s such a creeper. I see what you mean in regard to procedurals. And I’m not really a fan of them. Although I’ve just recently started watching Scandal –and for my general view proclivities– that’s as close to a procedural as I have come. But while it still has, as like you said, “Olivia Pope fixes a problem,” every week and is so compelling. In that context, I guess where Wonder Woman fails is the execution. Maybe that’s the difference because I totally didn’t get caught up in the Andros/Diana situation. Maybe we do? I guess it was just that moment where I think that’s maybe the biggest problem for me in terms of watching the show. And I do think that if we had a Wonder Woman show now, that hopefully it would be much different, the time period of this is a huge factor. Noel: I’ve become predictable! Dammit. It’s one of the perks and perils of this sort of a formula adventure show/procedural (not exactly sure we can call Wonder Woman a procedural, but it was the first thing that came to mind while I was working through your comment): You have a format each week for something new. Didn’t like last week’s? Well, maybe the next week’s episode will be better since the show starts over from scratch, just with the same characters in place. Not a lot of primetime programming (plenty of kids’ action programs are like this though) operates in this vein any more beyond the medical or criminal procedural. The closest I can think of is Doctor Who, and even that, like Scandal (or so I’ve read since I don’t watch Scandal — though clearly I need to be) has some serialized element to keep viewers hooked in beyond the “Olivia Pope/The Doctor fixes a problem” format. Was there anything else that stood out to you? Kerensa: Not really. 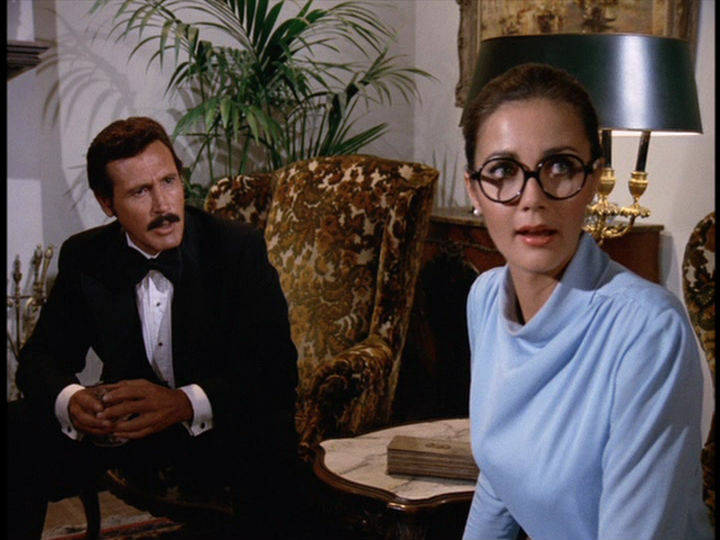 I mean I’m sure we both screamed at our televisions when dapper gentleman Mr. Antonio Cruz told Diana she’d be so much better looking if she took her glasses off. Although I really like how she used that later to get him to go away before twirling into Wonder Woman. Oh and all his delightful commentary on why he loves American women. Ugh. We’ve discussed before that we both would like more for Etta to do. But I do really appreciate her comic relief and also being the only person to recognize that there is something happening between Steve and Diana. Although, I think she really needs to get laid. Noel: I did want to see how you felt about Maria. She’s in league with the Nazis, but doesn’t seem to be a staunch member of the Reich. Was it a case of being too long undercover with Moreno and his family and coming to care about them, or was she just an agent that the flipped? I couldn’t get a full grasp on her character beyond having lovey-dovey eyes for Karl and that regret at her involvement in the plot. Also, less serious question Did you cringe as Steve and Diana toppled that entire shelf of perfectly innocent wine to get the guards’ attentions? Wouldn’t a few bottles of some of the cheap stuff have done just as well? Did they really need to sacrifice the whole shelf?! I sobbed a little bit. Kerensa: I thought that Maria was interesting. When the episode first started, I thought that Maria and Moreno were together actually–and I felt this weird tension between them the whole time. I think she could have been super interesting–I mean she was working with Moreno on something that’s meant to read as difficult (despite our feelings about it) and there’s so much potentially great story with her working undercover that, like we both would agree I think, was super underdeveloped in this episode. And it’s gross that despite all that potential, the focus remains on Maria being so in love with Karl. Ugh. NOT JUST WOMEN. WE ALL DATE TERRIBLE PEOPLE. So much wasted wine. I laughed so hard during that scene though. It was so funny when Steve just couldn’t move the shelf at all and it seemed like he was hoping to impress her. But his strength is no match. Although Diana’s probably impressed by Steve’s good heart or something like that. Blergh. We have two (!!) episodes left in Season 1, and Kerensa and I are going to take two weeks off after we complete it. I’ll still have some sort of content to run on Tuesday, though I currently have no idea what that content will be. Netflix has select episodes of some early TV streaming, so maybe thoughts on those. WHO WANTS TO READ ABOUT THE GOLDBERGS?! You’re right–this is a pretty boring episode. Needed a Kandel rewrite. 🙂 I don’t know if it has ever been noted how much WONDER WOMAN owes to THE SIX MILLION DOLLAR MAN and THE BIONIC WOMAN, particularly the way it films its action scenes. Because of the shows’ juvenile fans, you never see the heroes throwing any punches in the fights. They just sort of toss the bad guys around or use the patented Steve Austin move of jamming a bionic palm into his opponents’ chest. Wonder Woman even has special sound effects when she leaps through the air, like Steve Austin. I wonder whether WONDER WOMAN would even have existed if THE BIONIC WOMAN hadn’t come first. I think it’s a little unfair to criticize the episode for “Wonder Woman is always going to prevail, that no one is going to die.” Well, of course not, that’s the nature of episodic television. I also know Don Draper is never going to die of lung cancer or VD, but I’ve never heard anyone make the same criticism about MAD MEN. Even a series as intelligent and complex as THE PRISONER is bound to the formula of episodic television. Number Six matches wits with Number Two, tries to escape, is foiled, rinse and repeat. *All* episodic television is formulaic. The destination isn’t important, however, but the journey is. Six Million and Bionic are influences for sure, but they’re also the reason why ABC dragged its feet in picking up WW: They didn’t want to overdo it on the superhero adventure shows, even with Lynda Carter’s running in a star-spangled bustier. And Don Draper should probably just die.